Sleeping man in Mumbai, India, submitted to ‘First Light’ on National Geographic. Kristian Bertel has contributed to the National Geographic Your Shot photo community with an assignment called ‘First Light‘. The Your Shot photo assignment curated by Kurt Mutchler, a senior photo editor at National Geographic Magazine, is focusing on the quality of natural light, its character, subtleties and beauty, and how it enhances a photograph. First light is magical and worth a look, where photographers are able to capture a moment of soft light within the time in the morning. Kristian Bertel participated with one of his recent photos from India, which depicts a sleeping man in the Andheri area of Mumbai, India. 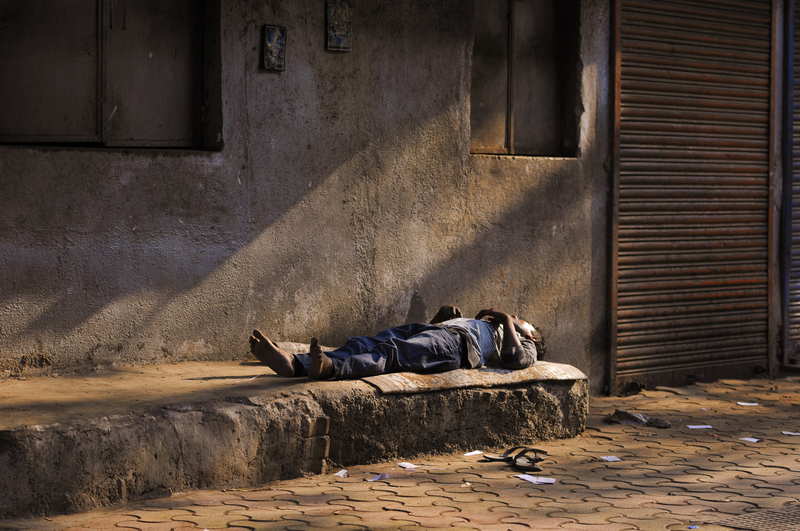 “- I was literally stunned by the morning light, which was beaming down on this man sleeping in Mumbai, India. When I this morning was walking in this area of the city, I noticed the way the sun was reflecting on the stone wall and continued down on the sleeping man, which is one of the things I think make this photo great. It was almost like the light on a movie set. I particularly also like the color tones of this photograph, which all are in the modest natural brown and golden tones”, he says. In photography, the golden hour, sometimes known as magic hour, especially in cinematography, is a period shortly after sunrise or before sunset during which daylight is redder and softer compared to when the sun is higher in the sky.